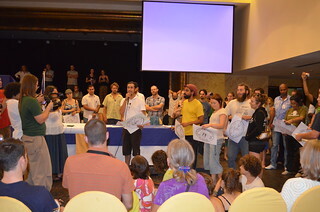 'IPC' stands for International Permaculture Convergence, it is a gathering of practitioners of permaculture from around the world, people who are working with nature to design a better world. IPCs started back in 1984 in Australia, and is the key global meeting point for the international permaculture network. It is fully self-financed, so donations and sponsorships are greatly appreciated! Since 2005, an IPC Support Group has been helping IPC hosts and managing the process of choosing the next host. After discussions at the last IPC in Cuba, a new group has formed - the 'Friends of IPC', which is supported by Inquiring Systems International, its fiscal sponsor. This allows the IPC to raise funds and take tax deductible donations to support future events and scholarships and develop and maintain an IPC website to hold the records of previous events. Find out more here. India was chosen as the next IPC host in Cuba after presentations by Narsanna Koppula, director of Aranya Agricultural Alternatives, a highly respected permaculture initiative based in Andhra Pradesh. IPCUK is working with the IPC India team to make sure the Hyderabad IPC in December 2017 builds on the success of London. It will have the theme of “Close the Gap. Open the Circle". To be considered as a future IPC host you need to prepare an application form, make a presentation to the IPC support group, and have the Support Group's recommendation agreed by the General Assembly. Whilst there is no hard and fast formula, the intention is that IPCs move between countries in the global north and global south.